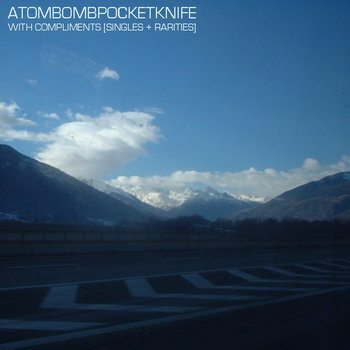 Formed in late 1997, Atombombpocketknife broke up in 2005 after multiple US and European tours, two albums and an EP on Southern Records, and a final third album in 2004 entitled Lack and Pattern on File 13. After a final string of performances including ATP and SXSW, the band members decided to stop playing together, but remained close friends. ABPK reunited for one week this past summer to play a private wedding at Chicago’s The Empty Bottle. The show inspired band member and File 13 owner Justin Sinkovich to dig through his archives and compile a gratuitously long 37-track singles and rarities collections called With Compliments. The two and a half hour compilation is comprised of singles, demos, covers, remixes, and live recordings.